Who doesn’t love a good burger? 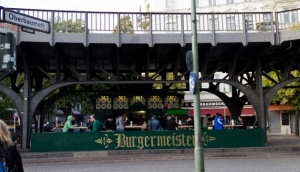 Burger joints have been popping up all over the place in Berlin in the last few years; there are about half a dozen in Prenzlauer Berg alone. Burgers seem to be the new food of choice for the Berlin crowd. Locals and travellers flock to these burger bars, small and large, for take away or eat in, gourmet or standard, beef, chicken or even vegie burgers are on the menu with a side of hot chips and sauces. Forget McDonalds or Burger King, these are the real deal!